In 1847, Hungarian doctor, Ignaz Semmelweis made a remarkable discovery. When doctors washed their hands in a solution of chlorine and water, childbirth fever rates at Vienna General Hospital dropped from 18% to near zero. Offended that Semmelweis implied doctors were killing their own patients, the medical community rejected hand washing as an infection prevention measure, and drove Semmelweis out of medicine and into an insane asylum. A few years later, Louis Pasteur and Joseph Lister made scientific advances that reinforced Semmelwies’s claims about germ theory and infection. Hand washing between patient examinations is considered best practice today. In spite of all scientific evidence, we still live in a world where hand washing isn’t universal practice. Folklore, tradition, and culture exert powerful influences on human behavior. You can’t convince everyone with research. You might recall that Pasteur invented vaccinations, too. In 1977, the Journal of Reading (now The Journal of Adolescent and Adult Literacy) published Richard Allington’s landmark paper, “If They Don’t Read Much, How They Ever Gonna Get Good?” Allington described factors that engage children with reading and charged that ineffective reading instruction hindered reading development for many children. Almost 40 years later, many educators remain ignorant of Allington’s findings or reject his observations outright. Multiple studies since 1977 have identified what helps children learn to read well and become lifelong readers, but the general public and many educators remain ignorant of this research. The National Reading Panel Report caused as much damage to reading instruction practices as the standardized testing movement and set independent reading initatives in schools back decades. Instead of considering what necessary “guidance and feedback” teachers must provide students for independent reading to become most effective, many school districts and reading programs threw out independent reading altogether. Almost immediately after the report was released, the reading research community jumped to disprove the Panel’s dismissal of independent reading. Conducting meta-analysis of over 50 reading research studies, Stephen Krashen found that the single greatest factor in reading achievement (even above socio-economics) was reading volume—how much reading people do. Krashen’s influential book, The Power of Reading, has been in print for 11 years now, but the New York Times still quotes the National Reading Panel from time to time. I’m frequently asked to substantiate with research my opinions about independent reading. I don’t mind. The research is ubiquitous and it doesn’t take me much time to find it. While I am happy to provide websites, journal articles, and book recommendations for colleagues seeking more information about reading research, I often wonder why people ask for it. Does anyone go to the basketball coach and ask her to provide research to support why players are running plays and practicing shots? Does anyone go to the band director and ask him why musicians are playing their instruments during band class? Why must English teachers constantly defend the need for students to practice reading and writing in a class dedicated to reading and writing? Do we really need research proving that kids who read the most outperform kids who don’t read that much? Do we really need research proving that when readers are engaged with what they read they invest more effort in reading? Do we really need research proving that when kids have books in classrooms, libraries, and homes they read more? I suspect many of the research requests I receive are from teachers who need research to convince administrators or parents who question why kids are “just reading” in a reading class. 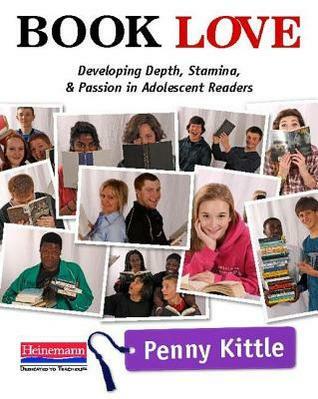 You can find more reading research by cross-referencing the bibliographies of my books, and books by Kelly Gallagher, Linda Rief, Laura Robb, Kylene Beers, Penny Kittle, Teri Lesesne, Jeff Wilhelm, Lester Laminack, Janet Allen, Cris Tovani, Franki Sibberson, Nancie Atwell, Lucy Calkins, Irene Fountas and Gay Pinnell, and other teacher practitioners and researchers who have written well-regarded books about reading. I invite everyone to share in the comments section of this blog post the professional resources that have formulated the research-basis for your teaching methods. We can all learn and share from each other. You might be saying to yourself, “Oh, you can get research to say anything.” No, you can’t. You cannot find credible research proving that the Sun rotates around the Earth or that bad air causes diseases. You cannot find research proving that test prep improves children’s reading achievement or test performance. Today, any doctor who rejected hand washing as a basic hygiene measure would lose his license. Rejecting foundational research in reading education is teaching malpractice. Pinterest and Teachers-Pay-Teachers aren’t pedagogy. We must become knowledgeable and remain current about research in our field. That’s what professionals do. The children we serve deserve professional teaching. This week, Scholastic announced its new global reading initiative, Open a World of Possible. Through education programs, print and online resources, and literacy events, the Open a World of Possible campaign promotes the importance of independent reading for children and provides tools to support and sustain independent reading initiatives in our home and school communities. Watch the inspiring literacy campaign video written by National Student Poet, Sojourner Ahebee, and narrated by actress and mom, Sarah Jessica Parker and videos from kids, parents, and teachers celebrating their love for reading. Register for the November 6th Bigger Than Words webcast with Usher. Access Scholastic’s comprehensive reading research summary, The Joy and Power of Reading, and practical, research-based resources for parents and teachers. 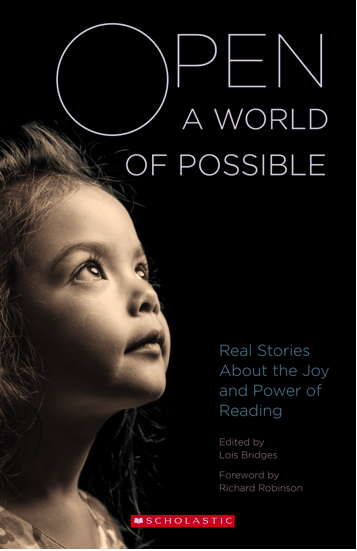 Read Open a World of Possible: Read Stories About the Joy and Power of Reading, which includes over 100 essays from literacy thought leaders, researchers, teachers, and authors like Katherine Paterson, Jimmy Santiago Baca, Walter Dean Myers, Alfred Tatum, Penny Kittle, Franki Sibberson, and Colby Sharp. Share these essays at staff meetings, education classes, and parent programs. Children will adore reading and discussing author Kwame Alexander’s poem, “How to Read a Book.” The e-book is available as a free download. I’m honored to participate in the Open a World of Possible initiative, which advocates for young readers and their families, and inspires us all to promote and encourage independent reading in our homes, classrooms, and communities. As a sneak peek, enjoy my essay “Reading Sent Me to the Principal’s Office,” which appears in the Open a World of Possible anthology. My beloved elementary school librarian, Mrs. Potter, changed my reading life forever—a reminder of the power we have to influence children’s reading lives each day. The only time I went to the principal’s office was because of reading. My mother claims this isn’t precisely true, but it’s my story, so I get to tell it how I want. A precocious reader, I don’t remember a time when I couldn’t read. Knowing how to read by first grade didn’t seem like a problem to my mother and me, but my teachers thought differently. Initially enthusiastic about school, I was bored with the phonics worksheets and bland textbook stories that made up our school’s reading program. In third grade, my teacher, Mrs. Shugart introduced us to a new reading activity—SRA cards. Stored inside a large box, each color-coded card included a reading selection on one side and comprehension questions on the back. Mrs. Shugart tested each of us—determining where we should start in the SRA program, and for an hour every day, my classmates and I read SRA cards and answered questions. I didn’t mind reading SRA cards. I knew I was a good reader and also a little bit of a show-off. I don’t remember where I started in Mrs. Shugart’s box, but I burned through those cards. Every day, when I turned in my questions, Mrs. Shugart clucked her tongue and scrutinized my work, “Three cards today? Are you sure you’re really reading them?” I stood at her desk while she checked my answers against the key. If I missed even one question, she would send me back to my desk to repeat a card—insisting that I read too quickly. Eventually, I finished the last card in the box. Mrs. Shugart didn’t know what to do with me during SRA time, so she made me sit with other kids and help them read their cards. I hated it. One day, Mrs. Shugart returned from the office to find me standing at the chalkboard, chalk in hand, writing the answers to SRA cards on the board. With a gasp, she snatched me by the arm and marched me down to the principal’s office. The secretary called my mother. No-nonsense about behavior and grades, my mother was unhappy about getting a call from school. Waiting for Mrs. Shugart, Mom asked me what happened, “You were cheating? What were you thinking, Donalyn?” While she talked with Mrs. Shugart and our principal, I sat outside the office in agony—imagining increasingly horrific punishments. And that’s what I did. Every day during SRA time, for the rest of third grade and into fourth grade, I worked as Mrs. Potter’s library aide. Looking back, I recognize that spending an hour a day with Mrs. Potter permanently influenced my reading life. I don’t remember what Mrs. Potter looked like, but I can still hear her voice in my head, “Horses? You like horses? Have you met Marguerite Henry? Let’s start with King of the Wind.” After King of the Wind, I read every Marguerite Henry book in the library—Misty of Chincoteague, Brighty of Grand Canyon, and White Stallion of Lipizza. I read Anna Sewell’s Black Beauty, too. When I ran out of horse books, Mrs. Potter steered me toward other animal books like Old Yeller by Frank Gipson, Rascal by Sterling North, and Marjorie Kinnan Rawlings’ The Yearling. Every book Mrs. Potter gave me launched another adventure. Each time I returned a book, Mrs. Potter spent a few minutes chatting with me about the story, asking what I learned from the book and what parts I liked. Under her guidance, I read a staggering pile of books—Laura Ingalls Wilder’s Little House books, The Borrowers by Mary Norton, most of the Newbery winners, and selections from the Childhood of Famous Americans series. In my opinion, Mrs. Potter was a magician—able to find a book that matched any random interest of mine. I took reading for granted before my two years with Mrs. Potter. I enjoyed reading, but I didn’t grasp the power of reading until she showed me. From then on, my education belonged to me because I loved to read. I can learn about anything, travel anywhere, ask my own questions and seek my own answers because I read. Thanks to Mrs. Potter’s wisdom and guidance, my life has been one long reading adventure—rich and exciting and mine. It happens; the original thinking behind an instructional idea becomes lost when it’s passed along like a game of Telephone. You heard about it from a 60-minute conference session. Your teammate attended a book study and she gave you the highlight reel. The teacher down the hall is doing something innovative. You should try it. We’ve all seen the quick adoption of shiny, new ideas without a full picture of how these concepts fit into best practices (or don’t). I’ve shared many ideas through my teaching and writing, and I stand by what I’ve put out into the world—but the one idea most demanding a revisit is my 40 Book Challenge, which appears in The Book Whisperer. In a nutshell, the 40 Book Challenge invites students to read 40 books across different genres during the school year. I wonder sometimes if I failed to communicate the true intentions behind the 40 Book Challenge. Teachers email me or contact me on Facebook and Twitter about it every day. 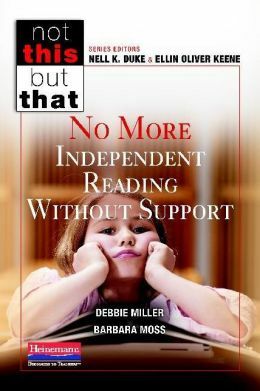 I have also seen a lot of what my dear friend, Teresa Bunner calls, “Book Whisperer Gone Bad” activities that actually undermine children’s development as independent readers instead of fostering it. On Teachers-Pay-Teachers, I found worksheets, award certificates, rubrics, and posters using “The 40 Book Challenge.” While citing me as the source (shudder), the teacher who designed these materials offers incentives and creates competition between readers—the antithesis of my teaching philosophy and research about incentives tied to reading. An unfamiliar parent emailed me to complain. She tracked me down on the Internet after asking her son’s teacher about the “outrageous requirement” that students read 40 books and complete 40 book reports this school year. Her son’s teacher said the assignment was based on my work, and this upset mom wanted me to know that I was hurting her son. I responded that while I expect my students to read 40 books, I don’t tie any assignments or grades to this expectation. A close friend shared on Facebook that a teacher publicly humiliated his daughter because she “only” read 35 books this school year. The complexity or length of the books his daughter read weren’t considered. What she gained from these reading experiences didn’t matter, either. Visiting a school last spring, a 4th grade teacher told me that she didn’t “allow” her students to “count” any books that were under 100 pages long. Walking the school library together, I asked the teacher to look at the biographies, traditional literature, and nonfiction texts available (and appropriate) for her 4th graders to read. After 20 minutes of searching, we found 12 biographies that met her stringent guidelines. It never occurred to her that she was limiting her students’ choices or access to books. The 40 Book Challenge isn’t an assignment you can simply add to outdated, ineffective teaching practices. The Book Challenge rests on the foundation of a classroom reading community built on research-based practices for engaging children with reading. Assigning a 40 Book Challenge as a way to generate grades or push children into reading in order to compete with their classmates corrupts everything I have written and said about reading. The 40 Book Challenge is meant to expand students’ reading lives, not limit or define it. The 40 Book Challenge is a personal challenge for each student, not a contest or competition between students or classes. In every competition or contest there are winners and losers. Why would we communicate to our students that they are reading losers? For some students, reading 40 books is an impossible leap from where they start as readers, and for others, it’s not a challenge at all. If Alex read two books in 4th grade and reads 22 in 5th grade, I am celebrating with him. What an accomplishment! Look how much Alex grew. He didn’t grow because he read more books. He grew because he had 22 successful reading experiences. Conversely, when Hailey read 55 books in 4th grade, reading 40 books in 5th grade isn’t challenging her. Encouraging Hailey to read biographies and historical fiction, which she claims to detest, does more to stretch her than simply reading more books. Everybody reads here. Let’s get started. 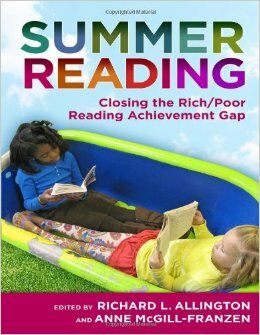 Our direct influence on students’ reading lives lasts 40 weeks—36 weeks of school and 4 weeks of school vacation. Setting high expectations (roughly a book a week) communicates that reading is ongoing and continues from the first day of school to the last—hopefully longer. Students should spend more time reading than they spend completing reading-related activities like worksheets, reading responses, and projects. 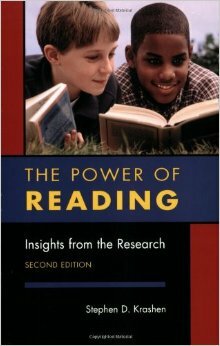 Students who read the most will always outperform the students who don’t read much (Krashen, 2004). *Strong readers have lots of reading experiences. You need to be a good all-around reader. Encouraging students to read widely—sampling books from every genre—improves their reading ability by expanding their reading experiences. If you spend every day working on your jump shot, you’ll improve your jump shot. To be a strong all-around player, you must practice passing, guarding, and dribbling, too. To be a strong reader, you must practice reading poetry, fiction, nonfiction, wordless books, graphic novels, blog posts—a little bit of everything. *There’s the right book for you out there somewhere. Let’s find it. For many students, trying a lot of books helps them find the one type of text that excites them and invites them into reading. True preferences come from years of wide reading—trying books, having some false starts, discovering authors, genres, and writing styles that we enjoy. Students who haven’t read much may not have found the books that speak to them. Reading buffet-style—tasting all types of books—students can discover what the world of reading has to offer. *Whether you read or not isn’t a choice, but what you read is YOUR choice. I don’t waste a lot of time at the beginning of the school year talking about why students might not like to read. Everybody reads here. Everybody is a reader. Whether you read or not is off the table, but what you read is your choice. Whatever you want. You pick. Providing students with choice in what they read increases their reading motivation and engagement (Gambrell, Coding, & Palmer, 1996; Worthy & McKool, 1996; Guthrie & Wigfield, 2000). *Your reading life matters. Students’ personal reading goals have as much value as our academic goals. Classrooms exert tremendous influence on the development of students’ reading identities—whether it’s positive or negative. While students learn the skills of reading, they must develop a positive reading identity to remain readers (Serafini, 2013). 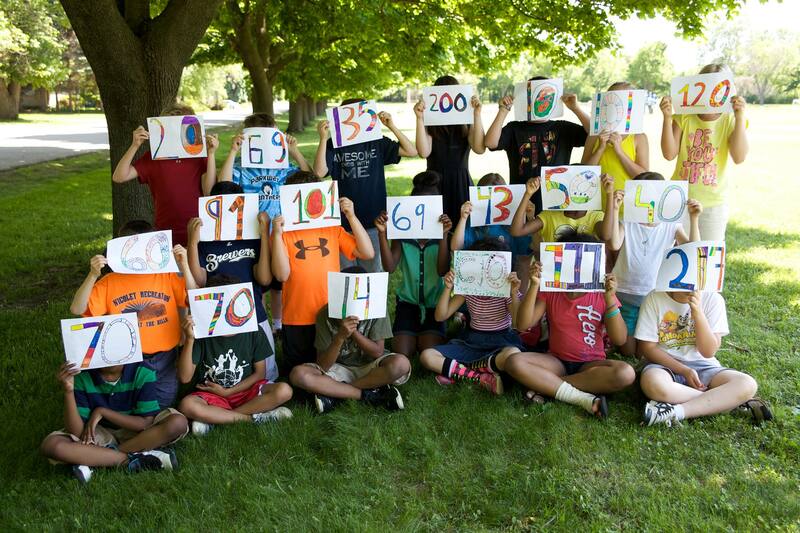 Aliza’s 20 students read 1741 books last year and they all met or surpassed their academic reading goals. More important, these 9-year olds developed a bond with each other and with reading that will last long after 3rd grade. Recounting anecdote after anecdote about her students’ individual reading successes, Aliza told me, “I could go on and on, as I am so proud of each of them in their own way.” Looking through the photos of Aliza’s beaming students, this note from Kristen made me smile. 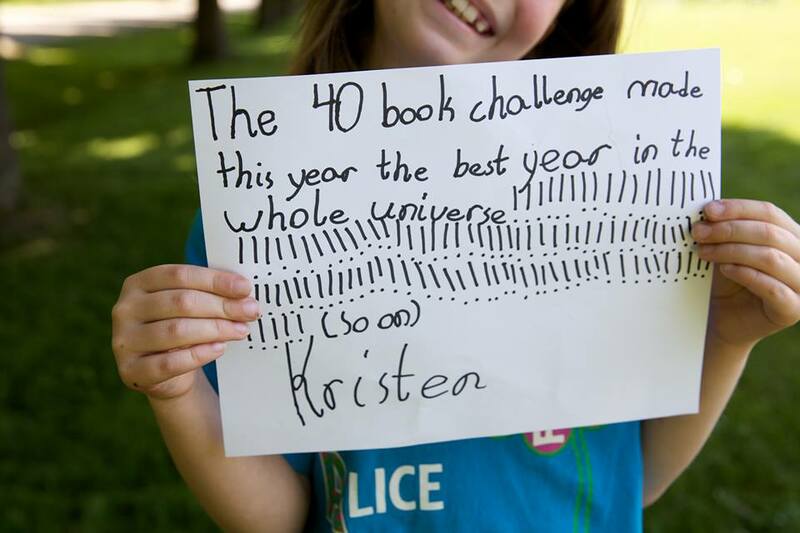 It’s clear that Aliza and her students embraced the full intent of the 40 Book Challenge. 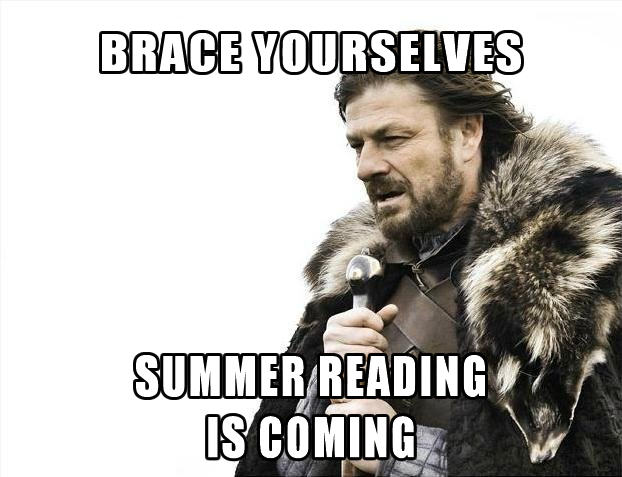 Aliza says that her students are still chatting over the summer–sharing their reading. In a classroom culture where reading threads through every class day and every conversation—everyone grows as a reader and finds reading more interesting and personally meaningful. Every reader has value. Every reading experience has value. It doesn’t matter who ultimately crosses an arbitrary finish line. How can we empower our students and help them grow? How can we make reading an exciting adventure? What do we want our students to remember about reading and our classroom community when they leave? The 40 Book Challenge kicks off a year of reading. That’s Day One. What about the rest of the year? Developing students’ positive reading identities and development as lifelong readers—these must remain our priorities every day, all year long.